A shortage of trade finance, driven by a surge in the cost of its provision, has been listed as one of factors that contributed to the Great Trade Collapse. For instance, in 2009, the president of the World Bank at the time, Robert Zoellick, argued that 10-15% of the decrease in global trade during the Great Recession might be due to lower provision of finance for exports and imports under Basel II.1 Similar fears have been raised for Basel III, which initially imposed a flat 100% credit conversion factor for traditional trade finance instruments. International banking surveys conducted during the same period indicate that higher capital requirements under Basel II had a negative impact on banks’ provision of trade finance (Asmundson et al. 2011). This is a very relevant topic, as approximately 90% of global trade relies on some form of trade finance (e.g. Auboin 2009). Indeed, academic research shows that shocks to a country’s banking sector have an impact on its exports (e.g. Amiti and Weinstein 2011, Chor and Manova 2012, Paravasini et al. 2014). These findings are consistent with, but not direct evidence of, the hypothesis that banking shocks affect exports through their action on trade finance, as opposed to a more general bank lending channel that affects all firms, including those that are involved in international trade. The question is whether, and to what extent, a shock to the supply of trade-specific finance affects exports, while controlling for the shocks propagating through the lending channel. Empirical investigation of this question is fraught with a number of difficulties. One problem is that exports or imports data, however detailed, typically lack information on the form of trade financing used. Another challenge is to find a setting where a shock to trade finance can be identified separately from possible shocks to other types of bank financing. Finally, the empirical setting used needs to differentiate changes that are due to shocks to trade financing from those that are due to demand factors for the underlying products. In recent research, we try to shed additional light on this question by investigating whether changes in banks’ risk-based capital requirements affect firm-level exports, after controlling for changes in other types of bank financing and product-demand factors (Demir et al. 2016). We do so by exploiting the mandatory adoption of the Basel II framework in its Standardized Approach by all banks in Turkey on 1 July 2012. This regulatory change affected the cost of holding letters of credit (LCs) by changing risk-weights used to adjust for counterparty-bank risk to meet the Basel-mandated capital requirements. LCs are traditional international trade financing instruments that are issued by the importer’s bank (issuing bank).2 The importer’s bank commits to make the payment to the exporter upon the verification of the fulfilment of the conditions stated in the LC. The importer sends the instrument to the exporter, who then presents it to its local bank, together with all required documents. The exporter can request that the LC be confirmed by its local bank. In this case, the exporter’s bank (the confirming bank) also takes the responsibility of making payments if the importer’s bank fails to transfer the payment on due date. 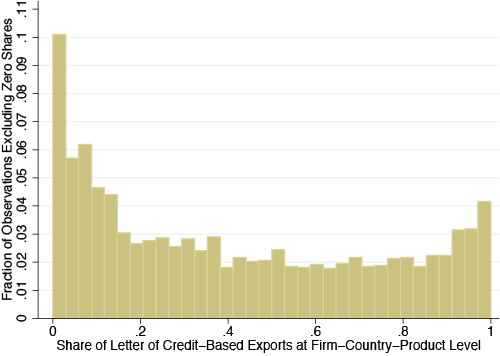 Our findings point to a composition effect: firms increased (decreased) their reliance on letters of credit when exporting to countries for whose banks the risk-weights (i.e. the cost of LCs) decreased (increased) due to Basel II adoption. However, changes in risk-weights introduced by the Basel II framework did not affect the firm-level export growth. The LC-issuing and confirming banks hold it as an off-balance sheet item, which creates a capital charge for both institutions. The related capital requirement is calculated by multiplying the nominal value of the LC by a credit conversion factor to obtain the on-balance sheet equivalent, and then, with a risk-weight to adjust for counterparty-bank risk exposure, and finally, with the minimum capital ratio. To illustrate the change in the capital cost of holding an LC for a Turkish bank due to the adoption of the Basel II framework, consider an export transaction with a value of $1,000,000 backed by an L/C issued by a non-OECD country-domiciled bank and with longer than three months of remaining maturity. Under the Basel I framework, holding this LC would cost the Turkish bank $120,000 (= $ 1,000,000 × 1.00 × 1.00 × 0.12) in capital, irrespective of the risk of the counterparty bank. Under the Basel II framework, the capital cost would either (1) decline by 80% to $24,000 for highest-quality and high-quality rated counterparty banks; (2) drop by 50% for upper-medium or medium-grade rated or non-rated counterparty-banks; (3) remain equal to $120,000 for speculative rated counterparty-banks; or (4) increase by 50% to $180,000 for poor-quality rated counterparty-banks and others.3 These risk-weight changes are non-negligible and could have important consequences for both the price of holding the LCs by the Turkish exporters’ banks, which can also choose to ration such services. In our data, the share of Turkish exports backed by LCs is about 12%, which is comparable to the worldwide use of LCs in international trade as reported by Niepmann and Schmidt-Eisenlohr (2016). Nevertheless, there exists considerable heterogeneity in the use of LCs between OECD and non-OECD countries, as well as across transactions within each category (Figure 1). Notes: Figure 1.a plots, for the OECD sample, the frequency distribution of the share of letter of credit-based exports at the firm-country-product level in the annual period preceding Basel II adoption on 1 July 2012 (i.e. 1 July 2011 to 30 June 2012) after excluding observations for which the share of exports is zero. Figure 1.b does the same for the non-OECD sample. Source: Demir et al. (2016). To identify the Basel II-induced effect of changes in the capital cost of holding an LC for a Turkish bank on exports, we compare the share of LC-backed exports of the same product and by the same firm across countries whose banks had, on average, differential changes in the counterparty risk-weights. Importantly, our analysis allows us to take into account the more general effects of Basel II on the provision of bank lending in the economy. Such effects could arise, for example, because higher risk-based capital standards may lead to less lending to all or some borrowers. If unaccounted for, the effects of changes in bank lending after the adoption of the Basel II might be wrongly attributed to risk-weight changes. We find that when the Turkish banks’ capital charges for holding LCs as off-balance sheet items are lowered (increased) following the adoption of the Basel II framework, the share of LC-backed exports to the associated destination countries increases (decreases). The implied risk-weight elasticity of the share of LC-backed exports varies between -0.08 and -0.15. Importantly, we find no statistically discernable effect for the growth of exports: while firm-country-product level exports aggregated over all payment types appear to respond negatively (positively) to the associated risk-weight increases (decreases), the observed effects are not statistically significant. Our results suggest that the effect of a shock to the supply of trade finance on international trade may be more subtle than is suggested in the popular press, inferred from banking surveys, or typically assumed in the trade finance literature. While risk-weight changes brought about by Basel II affect trade shares, the overall trade growth remains unaffected. Our empirical approach controls for many confounding factors, including changes in general bank-lending conditions. Our findings suggest that while the pure trade finance (LC) channel may not be quantitatively significant, there are other channels through which bank financing could facilitate international trade. For instance, a shock to the availability of short-term bank credit could affect export performance due to working capital shortages or firms’ reliance on such financing to purchase inputs for export production. Second, the pure trade finance channel may become more significant during crises when firms are less likely to have access to trade credit extended by their trade partners or they face increased non-payment risk for their export sales. At the time of our quasi-natural experiment, Turkish banks were well capitalised with Basel II leading to a decrease in their risk-based capital ratios by 1.5% only, leaving the banking sector capitalised at roughly 15%. Third, our result that the growth of firm-level exports remained unaffected by the changes in risk-weights introduced by the Basel II framework could be partly explained by regulatory arbitrage: firms and their banks might be finding alternative ways to finance trade to avoid the costs of changes in bank capital requirements. Ahn, J (2014), “Understanding Trade Finance: Theory and Evidence from Transaction-level Data”, International Monetary Fund, mimeo, May. Amiti, M and D Weinstein (2011), “Exports and Financial Shocks”, Quarterly Journal of Economics 126: 1841–1877. Antras, P and C F Foley (2015), “Poultry in Motion: A Study of International Trade Finance Practices”, Journal of Political Economy 123(4). Asmundson, I, T Dorsey, A Khachatryan, I Niculcea and M Saito (2011), “Trade and Trade Finance in the 2008-09 Financial Crisis”, Working paper WP/11/16, International Monetary Fund. Auboin, M (2009), “Boosting the Availability of Trade Finance in the Current Crisis: Background Analysis for a Substantial G20 Package”, CEPR Policy Insight No. 35. Chor, D and K Manova (2012), “Off the Cliff and Back? Credit Conditions and International Trade during the Global Financial Crisis”, Journal of International Economics 87: 117–133. Demir, B and B Javorcik (2014), “Grin and Bear it: Producer-financed Exports from An Emerging Market”, CEPR Discussion Paper No. 10142. Demir, B, T Michalski and E Örs (2016), “Risk-Based Capital Requirements for Banks and International Trade”, CEPR Discussion Paper No. 11565. Niepmann, F and T Schmidt-Eisenlohr (2016), “International Trade, Risk and the Role of Banks”, mimeo, July. 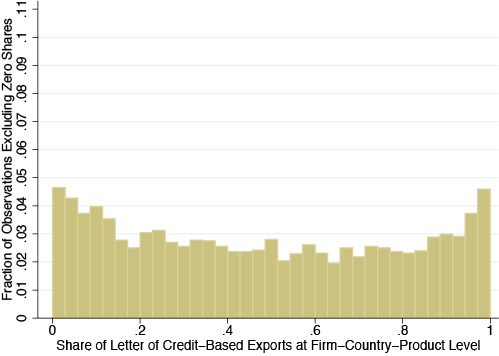 Paravisini, D, V Rappoport, P Schnabl and D Wolfenzon (2014), “Dissecting the Effect of Credit Supply on Trade: Evidence from Matched Credit-export Data”, Review of Economic Studies 1: 1–26. Schmidt-Eisenlohr, T (2013), “Towards a Theory of Trade Finance”, Journal of International Economics 91(1): 96–112. Financial Times, 19 February 2009. Zoellick urges a global response. Financing terms in international trade fall under three broad categories. Under open account terms, goods are delivered before a payment is made by the importer. Under cash-in-advance terms, the exporter receives the payment before ownership of the goods is transferred. Another widely-used financing method in international trade is documentary collection. Transactions on these terms are settled by banks through an exchange of documents. Although documentary collection terms do not involve a payment guarantee in case the importer defaults on payment, they serve the needs of both trade partners: the importer does not pay prior to shipment and the exporter retains ownership of the goods until the importer pays for the goods or accepts to pay at a later date. There is a recent, but growing body of academic literature that studies the choice of financing terms in international trade (e.g. Schmidt-Eisenlohr 2013, Ahn 2014, Demir and Javorcik 2014, Antràs and Foley 2015). For an LC issued by a bank located in an OECD country, the associated risk-weights either (i) increase by 150% (from 20% under Basel I to 50% under Basel II) for upper-medium or medium-grade rated or non-rated counterparty-banks, or (ii) stay constant at 20% for highest-quality and high-quality rated counterparty-banks.